República’s Editorial on Brawl at the Constituent Assembly | United We Blog! First of all, any constitution that emerges from the sovereign CA cannot be labeled just another piece of paper. The people elected the CA to deliver a constitution, preferably through consensus, or absent that, through due process. Whether the Maoist and Madhesi parties like it or not, the people have not given them the mandate to dictate terms for the new constitution, something they seem to be itching for. It is also disingenuous of the opposition to argue that the Nepali Congress and CPN-UML together enjoy a (near) two-third majority only in the legislature-parliament, and not in the CA proper. The truth is that when the people cast their ballots in the second CA polls, they had the constitution of new Nepal in mind, not whether the new government would last for four years. NC and the UML, in this sense, have the mandate to shape the new constitution. This is not to suggest that the proposals of the ruling parties on important constitutional and political issues are inherently superior to the ones pushed by the Maoists and the Madhesi Morcha. In fact, we have deep respect for the new forces that have played such an important role in bringing the issues of marginalized communities into the national mainstream and made the comfortable classes in urban areas confront the ugly realties of their country. Nor have we forgotten that were it not for the Maoists, the long-cherished dream of a Constituent Assembly might never have materialized in Nepal. Or that federalism is largely the fruit of the 2007 Madhesi Uprising led by the new Madhesi outfits. Since the 2006 Jana Andolan, these new forces have as such played an extremely important role. Thanks to their tireless activism, quotas and reservations have been established for marginalized communities at all public sector bodies. The participation of women has shot up in all sectors. But perhaps the most important change has taken place within the two ´establishment´ parties. NC and UML were forced to become more inclusive when the new forces started threatening their vote banks. People have together given NC and the UML a two-third majority because they believe these parties have successfully adapted themselves to new ground realities. This is not ´regressive´. If people really wanted to roll back the post-2006 changes, they would have given a clear majority to RPP-Nepal. Again, we have to understand that whatever the future tactics of NC and the UML, republicanism, federalism, secularism and inclusiveness are now firmly established facts of the Nepali polity. And if these parties want to stay relevant, there is no going back on them. Thus the argument of the opposition parties that the constitutional process led by these outfits will be ´regressive´, although understandable, given the deep trust deficit between the two camps, is hard to buy. What explains the kind of outrage of Maoist and Madheshi lawmakers that prompted them to resort to wanton vandalism inside the CA? Perhaps they don’t trust Nepali Congress and CPN-UML, the two traditional ‘elitist’ parties, to cement post-2006 changes. Perhaps part of the hostility is a reflection of the inferiority complex resulting from their diminished strength in the new CA. Whatever the reason, what happened in the CA on Monday was unjustifiable. 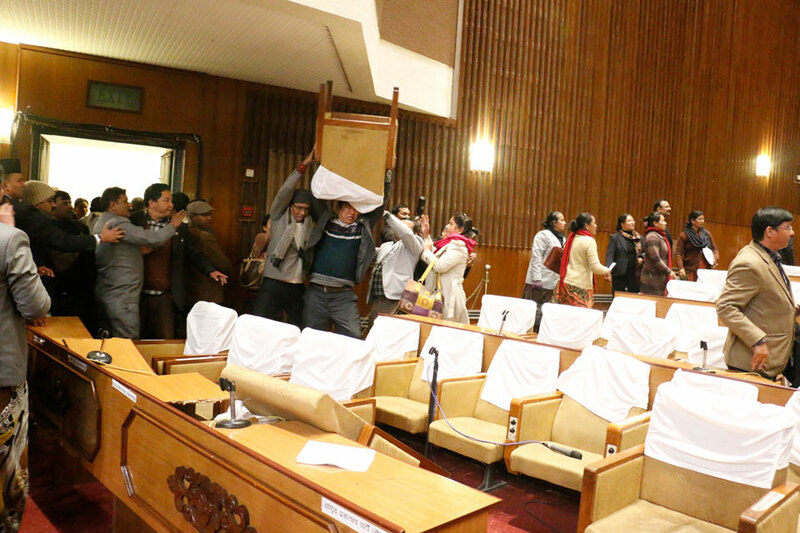 We had witnessed similarly ugly scenes in Nepali parliament as Nepali Congress and CPN-UML jostled for supremacy in the post-1990 free-for-all parliamentary politics. Yet that does not make the trail of destruction witnessed in the CA on Monday any more justifiable. More than anything else, it reflects lack of maturity of our democratic parties. It also puts a big question mark over the democratic credentials of the opposition parties and makes one question their commitment to timely constitution through CA mechanism. People are now starting to question: What do they really want? We urge the ruling coalition to go ahead with the voting process in the CA. It must not bow down to thuggish pressure tactics. At the same time, efforts at garnering broad support on important constitutional issues should also continue side by side. It would be unfortunate if developments of the last few days, however discouraging, break the chain of dialogue among major political forces. The broader the political support-base for the new constitution, the more legitimacy it will have. But, surely, it is also long past the time the prolonged political transition came to a definite end. The opposition lawmakers were heard shouting on the CA floor on Tuesday that the ruling coalition simply could not issue a new constitution through due process. That is an incredible claim. Due process is the heart and soul of democracy; and no democratic force can deny its centrality in national politics. Moreover, the opposition claims a constitution brought through due process would invite more instability. But we believe the danger is just the opposite. The risk of instability increases if there is no timely constitution. Political instability has ground development projects to a halt. Our industries have been devastated. The mass exodus of youth is starting to assume dangerous proportions. There is now a real danger that the country will fail to meet its target of graduating to ‘developing country’ status by 2022. All of this will disproportionately affect the marginalized communities that are hoping to catch up with the traditionally privileged groups. That is not all. The bigger risk is that protracted political transition would slowly undo recent achievements as people start to get disillusioned of the democratic parties and bolster extremist forces. We hope the rather forgettable scenes of Monday and Tuesday in the CA hall are not repeated and the opposition will come to its senses. The longer they obstruct the sovereign CA and try to impose crippling strikes, the greater the loss of their credibility. The country is at a critical juncture. A timely constitution is not the solution to all our problems, yet it will undoubtedly be a solid start to the creation of a more inclusive and equitable new Nepal. All the other alternatives, in our view, will invite more problems than they will help solve.